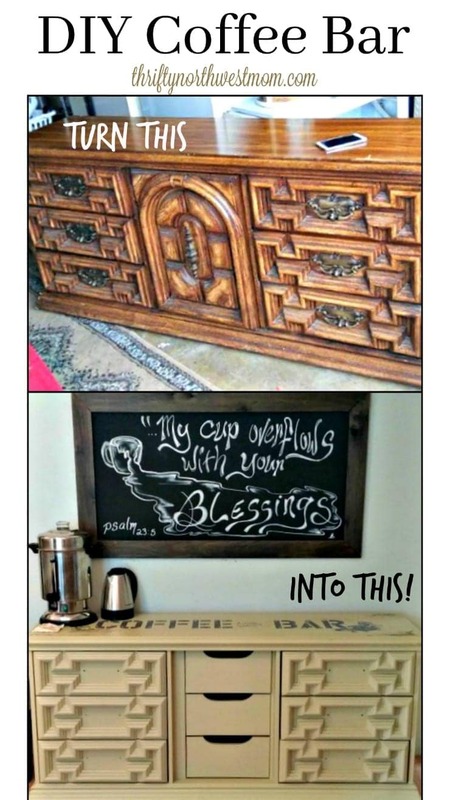 DIY Coffee Bar – Create Extra Counter Space by Converting An Old Dresser! Are you looking for a way to add some more counter space and storage space to your kitchen, without the big costs of a kitchen renovation. If you have a wall space that you can bump a dresser up against, here is an idea you can do on a serious budget! We used a long dresser to maximize space, but you could use any size that will fit in whatever space you can squeeze out (even a file size cabinet if you just have a small space). 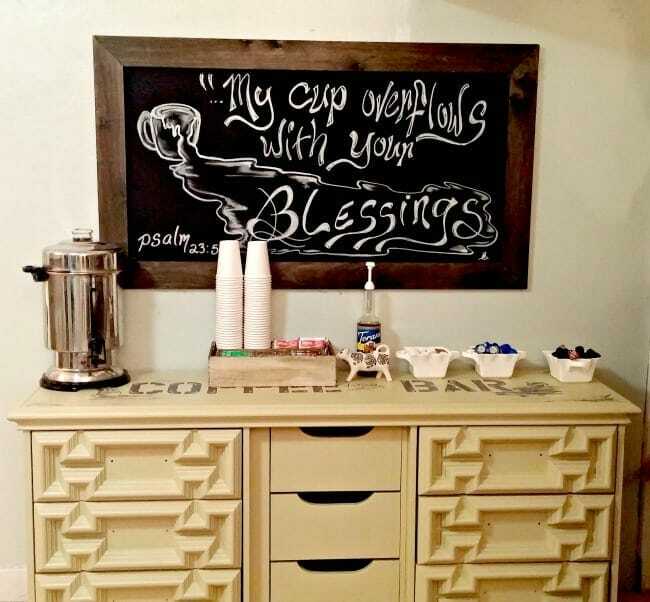 We used ours as a coffee bar, as we were making a small gathering space at church – but you could use this same idea in your own home as a coffee bar, buffet area to display food and snacks, or look for a remnant piece of granite or laminate and make a real counter top for it. Start by looking for a dresser that will fit the space you have available. 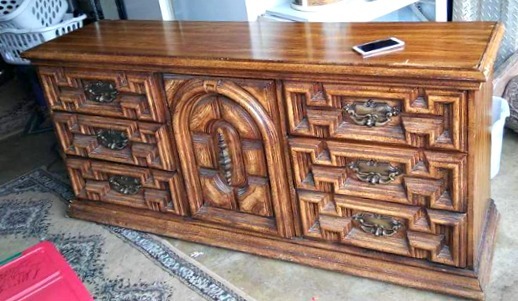 We were looking for something that was long (like a counter), and had drawers for extra storage. Don’t let something that looks outdated throw you off. Remember, you can always change out hardware, and paint updates a piece so well. Ask around in case anyone has a dresser they are giving away (or do you have one you want to re-purpose around the house). If not, look at spots like Offer Up, Craigslist, or local exchange groups. Thrift stores are another option. Here is the dresser we found on Offer Up for $15 (well, they were asking much more for it, but we offered $15 and they accepted). This dresser was heavy, which we liked for durability. We started by removing the hardware, and the middle door (behind it were the three simple drawers). Next we cleaned the dresser, and lightly sanded it (be sure to clean again with a tac cloth, or something that will remove the sanding particles). Then prime your dresser and let it dry thoroughly. Once the primer coat is dry, paint the dresser. Two coats is best, allowing it to dry completely in between. After you have painted out your dresser add a sealer to make sure the paint does not chip off. You can find sealers with a sheen, or flat ones, depending on the style you are going for. We are still hunting for the right hardware, but love how the bar turned out. 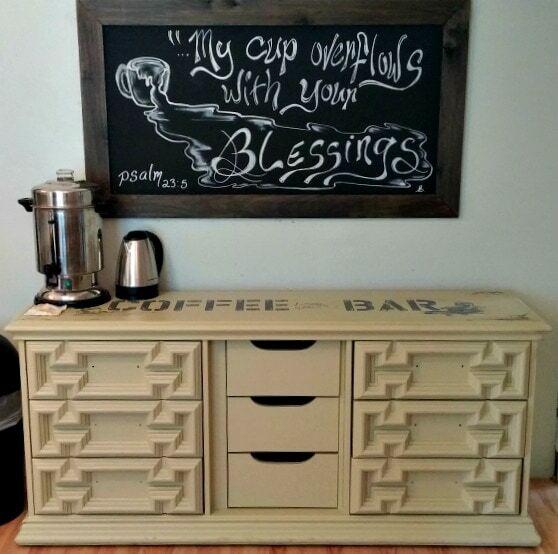 We embellished our coffee bar by adding a stencil to the top and then did some free hand painting of a coffee cup on it. The last step was to put out all of the goodies, which we are then able to neatly store away in the drawers when we are done using them! We also added a simple (and affordable) DIY chalkboards above it for more design. To make this we bought a peice of wood veneer at our local hardware store (veneer is the really thin wood). We then spray painted it with spray chalkboard paint (super easy! ), and mounted it to the wall. We drew the sign with a chalkboard pen, and then framed it out with a piece of 1 x 4 wood that we also grabbed at the hardware store, and stained first. All together it cost us around $25 for the chalkboard. 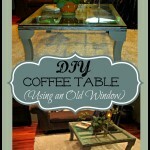 Here is an alternative idea for building a very affordable coffee bar area. In this spot we used an 8 inch wide plank board (you could use a 6 inch if you have less room, or two 1×4’s too). Cut it to the length of the bar you want, and stain it your favorite wood stain. We got ours for about $15. Next purchase large L brackets and secure those to studs in the wall (its important they are securely installed, or the bar may come down when you add stuff to it). Then secure your dried board to the brackets. 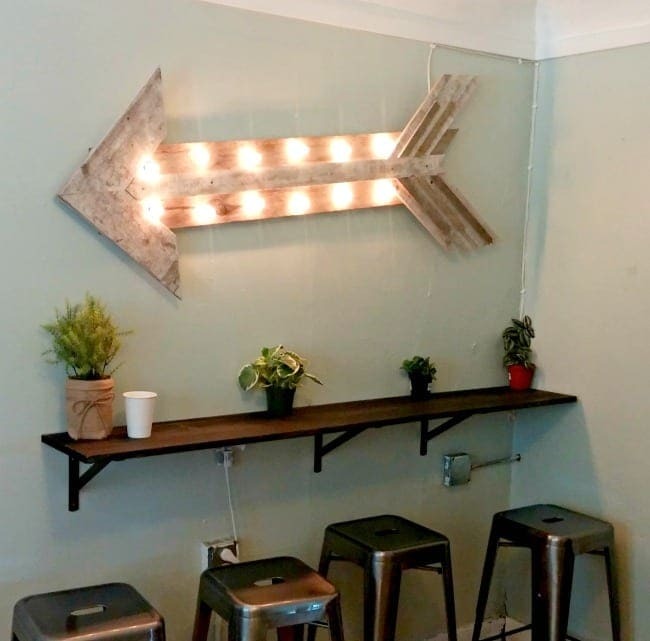 We made an arrow light out of reclaimed wood for the wall, and found our stools on sale at Fred Meyer (BOGO Free). We paid around $19 for each one. These are just a few ideas to inspire you to create with what you can find around you! Let us know what great ideas you come up with. 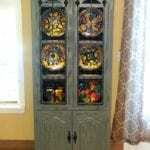 Turn a set of old book shelves and candle abras into this rustic hutch! 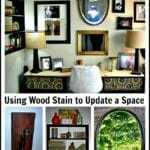 More ways to use stain to redecorate on a budget! Or find more DIY and Repurposing ideas on our DIY page here!